The concept of Old Mondoro is to take a step back from the ultra-luxurious lodges that have sprung up in recent times and rather to provide you with an authentic remote safari that concentrates on the wildlife and bush experience. The emphasis at this camp is on the natural setting and wildlife. You will enjoy a 'back to the bush' atmosphere. The 4 rustic chalets have en-suite bathrooms with flush toilet and bucket showers. The beds have thick foam mattresses and comfortable bedding and are simply furnished. They all have shaded decks. The camp is entirely constructed of natural materials and is partially dismantled each season. The main shelter houses the lounge and dining area overlooks the river. A traditional bush kitchen supplies the food and freshly baked bread. 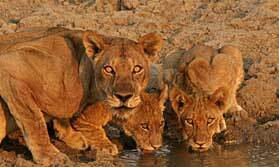 The camp is located in a grove of acacia trees on the banks of the Zambezi River in Lower Zambezi National Park. This is an area of vast floodplains and open woodland, which make it ideal for walking and game viewing opportunities. This is very different from the rest of the Park, which is on higher ground with thicker bush and large inland lagoons. Highly experienced guides will lead guests on walking safaris and game drives, and guests will have a good chance of spotting elephants, buffalo, hippos, lions and wild dog. Canoe trips are also offered from this camp. Open: Late April to Early November (Specific dates each year - please ask for details). Location: On the banks of the mighty Zambezi deep in the Lower Zambezi National Park. Rooms: 4 luxury rooms constructed of local materials and canvas. Tents have either 1 kingsize bed or 2 singles, all with mosquito nets, and round-the-clock lighting. En-suite facilities include a hand basin, flush toilet outdoor shower and 'splash tub'. There is full hot and cold running water. Each tent has a private sun deck with a daybed. Activities: Day and night game drives, guided walking safaris, canoing (water-level dependent), river safaris and fishing. Facilities: The lounge and bar area has cosy sofas with an under tatch dining area. A campfire is lit at night close to the riverbank. Dining: Meals are served communally out in the open or in the thatch dining area. The cuisine is a fusion of African and Euopean influences. Afternoon tea is a fixture, eaten overlooking the river wher elephants often gather, before you set out on the afternoon activity, and dinner is often served under the starry sky. Children: The camp accepts children 8 years of age and over. As the camp is unfenced, children need to be supervised at all times. "My favourite camp in the Lower Zambezi! The location, the rooms and the food were outstanding and I am definitely going to return here as a guest. My room overlooked a lagoon (all to myself) and while on my private deck I had a hippo and elephant and a number of different birds come to drinks â€“ all in the space of 1 hour! I loved every aspect of this camp and would recommend to people looking for a wonderfully, relaxing bush experience! " "I visited Old Mondoro by boat from Sausage Tree Camp and thought it was lovely. It's on a quiet back water off the main river, so you don't hear the masses of speed boats bumping past! The feeling at Old Mondoro is very friendly and laid back and it's superb walking country. So if you want a few days away from any civilisation and like to be on foot, this is ideal."